This is a great book for anyone just starting to explore idea of differentiated instruction. Even though the title states sixth through twelfth grade, the principles apply across the board. I have heard Rick speak on a few occasions and as a result, saw many of those presentations throughout the text of this book. I anticipate that being true on my next book as well. Good content. 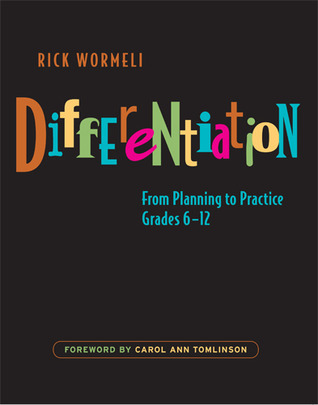 "Differentiation" by Rick Wormeli explains what differentiated instruction is, how to incorporate it into your classroom, and what it looks like once implemented. Differentiated instruction is a pedagogical method in which students are allowed to choose how they will engage with the subject/topic/material you are teaching. It's based on the multiple intelligence theory that we have certain ways we learn and when we are taught in a way that speaks to our learning intelligence, we will learn better and retain more.A great way to think of differentiated instruction is to think of time you've explained something to a group of people (doesn't matter how big the group is). Now, think about the people who had questions or needed clarification? Did you give them hands on instruction? Illustrations? Had them work with a partner? All of these are differentiated instruction. We do it outside of classroom settings all the time when we tailor how we explain something to someone's needs. Inside the classroom it takes a lot more work because you're working with more people and thus, more learning intelligences.I've been wanting to incorporate more differentiated instruction into my classes but have struggled to find how to structure the material in order to maintain academic rigor while providing choices. One thing that I've been doing is exactly what Wormeli recommends: start with the standards you're supposed to be covering, decide what you want the students to know, and formulate how you're going to formatively and summatively assess them. Then work from that framework and decide where are areas that students can access the information in ways that speak to their learning style?Since I work with high school students, many of them know how they learn or at least how they like to learn. Others are willing to ignore their learning intelligence in order to completely something the "easy" way and frankly, as long as they are the one's choosing to do that, it's on them. At some point we all have to take responsibility for our choices and it might as well start in the classroom. Back to differentiate instruction. Sometimes what I will do is state and write the objective on the board, then brainstorm with the class ways in which they can complete the objective. This gives us a menu for students to choose from. If they get stuck, sometimes I'll give a few ideas. Other times, I may be the one giving the students the options to choose from.One problem that I have is that teaching high school English there's not a lot of control I have over the curricular content. When I'm teaching American literature, there's a lot that's already decided for us based on the anthology and the fact that it has to be American. What I've done to give students access, is to give them choices into which selection(s) they want to read out of choices I give them. Then they can choose what discussion questions/topics they want to have.I'm still learning and Wormeli's book is a good introduction and sample of what differentiated instruction looks like. I'm very pleased with the index of resources he includes in the back of the book. Many of them look like they go more in-depth and provide even more examples to learn from. Last year, I had the widest range of learners I have ever had in my teaching career. A professional goal I am focusing on now is implementing more differentiation strategies. Now, "differentiation" is a term thrown around a lot in the educational community, so much so that I began to wonder if I even know how to do it. Rick Wormeli begins this book by assuring you that you DO know how to differentiate and have been doing it. One of Wormeli's main objectives is to get teachers in thinking that differentiation is only going to work if you believe that you can help students learn and will do anything to make sure they do:"This is the major component of differentiation:the mind-set. Everything else is craft. We can't get to the craft-the tips for management and orchestration of the differentiated lessons-unless our minds grasp this liberating process (11). "I like the questions that Wormeli posts to get teachers to reflect on where they have been and where they would like to go in their instruction. He then clearly lists steps and questions to consider prior to writing lesson plans. I like this book in the same way I liked "Understanding By Design." This is foundational. It also brings the focus on relying on what your students can do, more than on the curriculum. I plan to read some of the books in his Recommended Resources for more tips on different differentiation strategies. By the end of reading it, I was convinced that I can plan differentiated lessons and how important it is (Wormeli offers interesting cognitive science research), but I wanted to be able to see it more in the light of English Language Arts. I was teaching English to freshmen this year and ran into a lot of problems with students who would just skip assignments. The year ended with 14% not passing, all due to them not doing the work. I read this to get ideas for my lesson plans for next year to make the work less intimidating for some of my students who can do, but may get a little scared of the assignments. I know we will never get 100% passing when we are cramming 35 freshmen into one classroom for an hour's worth of instruction each day. But there must be a way to get better than a 14% passing rate.I did find some great ideas in this book; I plan on implementing them next school year. Rick Wormeli manages to make the impossible seem feasible. I appreciate his plain spoken "voice" and his books are full of great examples to show how DI should be done. I am looking forward to learning some new curriulum planning/management ideas as well as remind myself of ways to better meet my students' needs from this book. Wormeli does a great job of making the complex seem clearer and achievable. Many great classroom examples in this book as well as excellent references to key curricular theories. A great read and an even better reference. Would have loved to have seen school libraries & librarians included as a way to help differentiate. We can help obtain materials in a variety of formats & teachers can have another teacher to work with. I took much too long to read this book, but it didn't tell me much that I didn't already know, or hadn't already tried. Good book for new teachers.